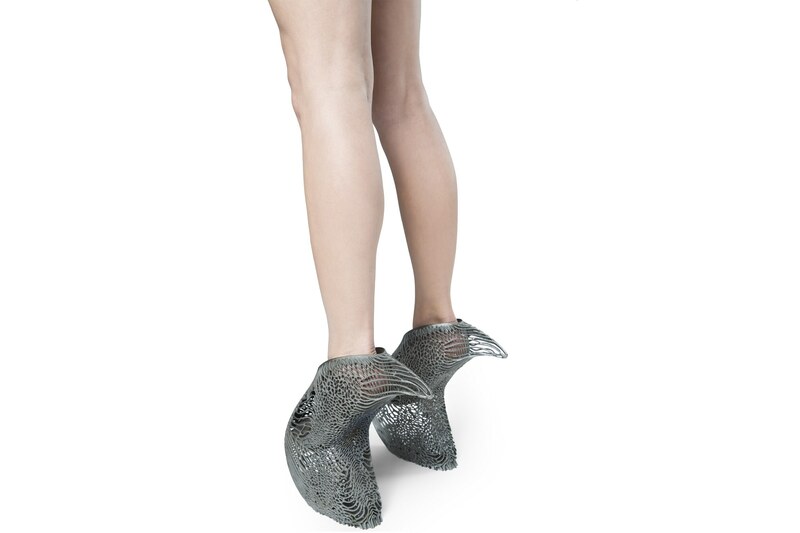 I can’t imagine walking in the new 3D printed high heels from design studio Ica and Kostika, but that doesn’t make them any less fascinating to look at. Called the Mycelium Shoe, the high heels’ texture does resemble some sort of mushroom, while their shape looks like a kind of curved shark fin sprouting from the ends of the wearer’s legs. More than one commentator on the design has brought up Lady Gaga, and they certainly are Gaga-esque, if not exactly something you’d expect to see on the average person. Don’t get your hopes up about seeing them in person anywhere, actually, because they’re being sold as a limited edition of only five pairs. The silvery platform heels, despite their intimidating appearance, are designed for comfort – as much comfort as towering, shark fin-shaped heels can offer, anyway. Like other 3D printed shoes, they are customized to the wearer, who downloads an app and takes a series of pictures of their feet. The interior cavity of the shoes is then designed to perfectly fit the wearer’s feet. The rest of the shoe is 3D printed and finished using automotive-grade technologies, which is saying something – shoes and automotive technology don’t generally go together. The Mycelium Shoe is the first piece being introduced by the brand new Ica and Kostika, which was founded by Ica Paru and Kostika Spaho. The shoe will be part of an ongoing collection called Exobiology. High fashion isn’t often synonymous with comfort, so it’s intriguing to think about 3D scanning and 3D printing being used to make avant-garde, sculptural pumps like these ones wearable. So far, there have been two types of 3D printed footwear – that which is designed for comfort, like customized insoles and athletic shoes, and that which is designed for artistic effect, to show off the incredible geometries and bizarre designs that 3D printing is capable of easily creating and that other technologies might not be able to manage. You don’t often see the two types combined, and that’s true of all fashion – the more artistic-looking it is, the less wearable it tends to be. Might these shoes be the exception? I can’t say without trying them myself, and as I am not Lady Gaga, that’s not likely to happen. The Mycelium Shoe certainly is something to look at, however – futuristic and almost dangerous-looking with its sharply pointed backs. I admit to being deeply curious about who the five people will be who buy these heels – they’re certain to turn heads if they wear them out and about on the streets. If shoes like these can actually be made comfortable, who knows – we may end up seeing more unconventional-looking footwear being worn by actual everyday people in the future, and 3D printing will almost definitely be a large reason for that.